Spielberg, Austria (AP) — A contrite and apologetic Sebastian Vettel accepted full blame again for the controversial racing incident with Lewis Hamilton at the recent Azerbaijan Grand Prix. Sitting alongside him at a packed news conference on Thursday, Hamilton accepted the apology but maintained justice was not done. Two weeks ago, an irate Vettel swerved into Hamilton, albeit at slow speed, because he thought the British driver slammed his brakes on recklessly late, right in front of him, seconds earlier. Vettel escaped further punishment this week after Formula One governing body the FIA reviewed the incident in Paris. Vettel traveled to the hearing, apologized, and escaped with a verbal warning from president Jean Todt. In other words, that dangerous driving went unpunished, in this case. After the race, an irate Hamilton said Vettel “disgraced himself” for his driving. Their heated clash further raised the profile of an already intriguing Formula One season. Vettel, chasing a fifth world title, leads the championship after eight races. Hamilton, chasing a fourth title, is 14 points behind in second place heading into the Austria GP this weekend. There was a buzz of anticipation before the news conference, and the mood was leavened by Danish driver Kevin Magnussen, the first of the three scheduled drivers to arrive. 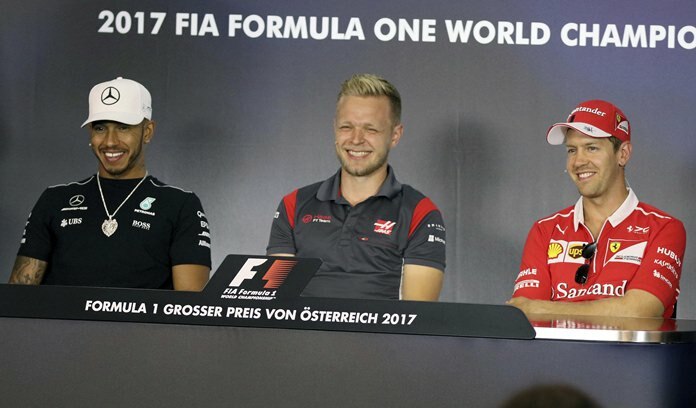 Magnussen gave a thumbs-up — jokingly pretending he was the center of attention — and pretended to leave his seat in the middle free, so the rivals would have to sit next to each other. Hamilton, sat on Magnussen’s right, filmed the large media crowd on his phone, while Vettel was on Magnussen’s left, sat stern-faced. “Best press conference ever,” Hamilton quipped. Then the questions began, with Vettel soon on the back foot. At the time, he explained, he reacted angrily because he thought Hamilton brake-tested him — a dangerous move in F1 whereby a driver suddenly slams on the brakes to impede the driver behind. Asked if he had used his car as a weapon, Vettel became defensive, arms folded. Other drivers, such as Brazilian veteran Felipe Massa, felt Vettel went too far. Although he felt Vettel should have been punished further, Hamilton insisted their mutual respect remains intact. Next articleHow’s my blood test?